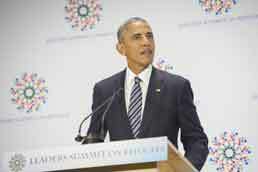 United States President Barack Obama addresses the High-level Leaders’ Summit on Refugees which he hosted on the margins of the UN General Assembly general debate. Photo: © UN Photo/Rick Bajornas. As Olympic swimmer Yusra Mardini opened the floor for U.S. President Barack Obama’s leaders’ summit on refugees, she embodied a hope unavailable to most child refugees. On Monday, the United States was one of the main countries to obstruct a U.N. Declaration that no child should ever be detained. Though welcome, the U.S.’ commitment the following day to resettle 110,000 refugees in 2017 was overshadowed by its ugly record on detaining unaccompanied minors.